There are about 80 million people in the United States who suffer from hair loss, and it can be a difficult condition deal with. Those affected often deal with issues related to their self-esteem. Having a healthy new head of hair can be a major boost to one’s confidence and can change your life. At RHRLI we have a permanent solution to hair loss and thinning hair called the ARTAS® System and it uses cutting edge technology to restore your hair. We’re the only hair loss treatment center on Long Island where the ARTAS® procedure is available. RHRLI is proud to offer this minimally invasive procedure. It’s different from other types of hair transplants you may have heard about like strip surgery. Because ARTAS® uses robotic technology you’ll be ready to resume normal life quickly. RHRLI wants you to see the ARTAS® System difference, so we want to take you step by step through this innovative procedure so you’ll understand why it’s the best treatment available. The ARTAS® System uses robotic technology to find healthy donor hairs on the back of the head for transplantation. According to the ARTAS® website, there’s no need for removal of tissue which leaves scars in the back of the head like you see with strip surgery, resulting in the quicker recovery time. 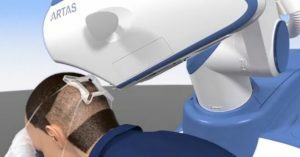 ARTAS Procedure Video from Restoration Robotics, Inc. on Vimeo. ARTAS® works to select the best hairs possible for transplantation and it works best when your hair is cut closer to your scalp. Some patients find it helpful to get their hair cut in stages prior to their hair transplant, say two to three stages before the haircut. Ultimately, you want the hair to be at 1 millimeter on the day of the procedure. On the day of your procedure you’re advised to wear loose, comfortable clothing. Some patients listen to music or watch a movie during the transplant. You will be seated and a local anesthetic will be applied, but you’ll be awake and alert the entire time. There will be breaks for lunch and to take care of personal issues. Your doctor, Baiju Gohil, MD will use the ARTAS® robotic arm to conduct the transplant with the most precision you can find out there. You’ll go home as soon as the transplant is over and you will be given instructions for your recovery. There can be a little discomfort after the procedure is over, that is easily managed with over-the-counter medications. You shouldn’t aggressively manipulate your hair for 5 days following the procedure. You may resume your normal shampooing routine, a week after the procedure and you’ll see hair begin to grow in the transplant area in about 3-5 months after the procedure. With the ARTAS® System, you’ll find that you’ll have a permanent solution to hair loss without scarring and you’ll be back to your normal life quickly with a new head of hair. To learn more, contact us today.